When most bread goes stale it gets tossed in the trash or fed to the birds. But for some lucky loaves, going stale is just the beginning of a transformation into bread pudding-the ambrosial dessert that is a mainstay finale at Creole restaurants across New Orleans. Though its roots go back centuries to the thrifty domestic kitchens of Europe – where a variety of sweet and savory pudding dishes evolved from the recycling of stale bread – the distinctively Southern-style bread pudding is a dessert New Orleans has embraced and made its own. Most such recipes start with bread soaked in a mixture of milk, eggs and sugar, which is then baked and sliced into squares or wedges. Served warm, bread pudding is usually covered in a rich, sweet sauce containing a strong dose of booze – most often bourbon. The main appeal of the dessert, however, goes back to its first ingredient. The bready foundation nicely sops up any sauce paired with it so that each bite is infused with its flavor. The bread base – soaked in milk and eggs – also lends a soft, spongy texture to the pudding that contrasts deliciously with toppings of pecans, walnuts or raisins that often accompany the dish. Although bread pudding is not a New Orleans (or even American) invention, it’s offered at many restaurants in the French Quarter and nearby, both the fine-dining and casual establishments. With a steady supply of French bread and no shortage of creativity, the New Orleans chefs have been concocting the variations of the dessert ranging from traditional to new interpretations. Most local chefs keep the bread pudding bread-based and sweet. Others may add their own twists to the sauce. You may also come across the savory versions, with cheese and chicken and Andouille sausage. One interpretation served in restaurants like Muriel’s and NOLA is pain perdu (the “lost bread”), a Creole cross between French toast and traditional bread pudding. Since there’s no “right” way to make bread pudding, the New Orleans’ own unique versions are worth exploring. Here are our recommendations for the best bread pudding in the French Quarter and nearby. This French Quarter casual eatery offers lots of other Cajun staples beyond its three types of gumbo and has a lovely courtyard. The bread pudding here is the traditional version, served warm, with whiskey sauce. Try it a la carte, or as part of the prix fixe Creole dinner ($26.99). 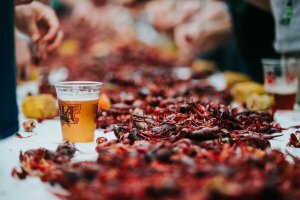 Founded by the late celebrity chef Paul Prudhomme, K-Paul’s Louisiana Kitchen is an upscale Cajun/Creole eatery with an open kitchen, lush courtyard and generous serving sizes. K-Paul’s traditional bread pudding is a mixture of breads soaked in rich custard and baked with pecans and raisins. This moist concoction is paired with a hard sauce, which is a sweet and rich dessert sauce made with butter, sugar, and several types of alcohol like rum and sherry. This legendary eatery is located outside the French Quarter on Poydras Street in CBD. Mother’s has a casual, cafeteria-style approach and had been around since 1938, becoming a famous hangout for the working crowd. The “Ferdi Special,” a baked ham and roast beef po-boy, was named after a loyal patron, and the Creole-style “Jerry’s Jambalaya” belongs to chef Jerry Amato, who had ruled Mother’s in the late 80s. The bread pudding is the traditional version, with brandy sauce. The casual French Quarter eatery at the corner of Bourbon and Conti Streets is a solid choice for Creole and Louisiana fare like crab cakes, po-boys and gumbo. It’s open late and has a lovely courtyard. Oceana’s traditional bread pudding is served with the restaurant’s own praline rum sauce and a whirl of whipped cream on top. With it huge, always-open windows, this casual Cajun restaurant on the corner of St. Louis and Chartres Streets is a prime spot for people-watching. The building that houses the restaurant is one of the oldest in the French Quarter, dating back to 1788. Legend has it Andrew Jackson met with the Lafitte brothers here when it was a coffee house, to figure out the plan for the Battle of New Orleans. The traditional bread pudding here consistently gets rave reviews. The iconic gem on Decatur Street hardly needs an introduction. The second oldest restaurant in the city, it was founded in 1856 and has since been offering traditional, fixed-price Creole menus to many a president and celebrity. Its famous bar takes credit for inventing the Grasshopper cocktail, and the restaurant may or may not take credit for creating brunch. 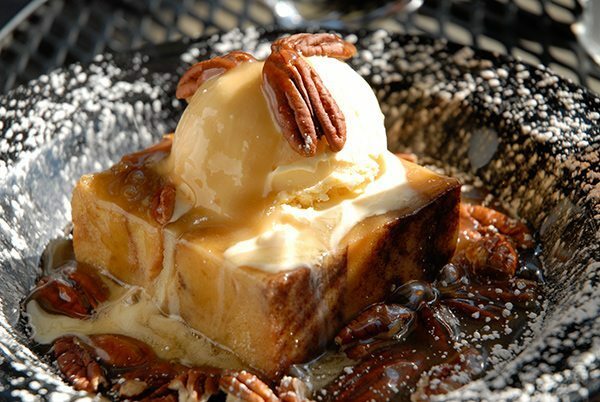 Tujague’s white chocolate bread pudding is served with Maker’s Mark caramel sauce. The Pudding de Pain de Noix de Pecan is as timeless and classic as the restaurant that serves it. This French-Creole fine-dining establishment probably needs no introduction. Let’s just describe the pudding: It’s a cinnamon, golden raisin, and pecan concoction topped with warm rum sauce. It’s also on Antoine’s famous Sunday jazz brunch menu. “Bread Pudding Fitzmorris” at yet another iconic and upscale Creole establishment is named after the city’s famous food critic and radio host of “The Food Show” on WWL Tom Fitzmorris. It’s not his recipe, but, apparently Fitzmorris praised this version of the dessert so much the restaurant owner named it after him. Antoine’s bread pudding is bread layered with thick slabs of custard and thinner layers of cinnamon, and topped with rum-soaked raisins and warm Bourbon Sauce. It’s also offered as part of Arnaud’s excellent jazz brunch menu. The bread pudding at this fine-dining Creole landmark comes courtesy of chef Slade Rushing. As the story goes, he needed to find something to do with thousands of egg whites left over from making the restaurant’s yolk-rich Hollandaise sauce — and that’s how the praline Leidenheimer bread pudding was born. You probably know Brennan’s world-famous Bananas Foster dessert, but the bread pudding is something special too: It’s Leidenheimer bread mixed with vanilla custard and pralines, and topped with rye whiskey creme anglaise and chantilly cream. The pain perdu version at Muriel’s comes with candied pecans and rum sauce (here’s the recipe). Enjoy it a la carte or as part of the prix fixe pre-theater dinner menu ($34.95). Muriel’s is elegance personified and won’t steer you wrong if you want contemporary Creole cuisine. Executive Chef Erik Veney’s menu has quite a few gluten-free items too. The restaurant opens up onto Jackson Square, so you can enjoy people-watching in the heart of the French Quarter. NOLA is Emeril Lagasse’s casual eatery in a warehouse space on St. Louis St. in the French Quarter. It reopened in September 2017 after a two-month renovation. The three-story restaurant has an open kitchen, chef’s food bar, and exposed-brick walls. Chef Philip Buccieri’s menu is classic Louisiana fare with contemporary twists. NOLA’s pain perdu bread pudding is no exception as it is served with brandy milk-punch ice cream and cherries jubilee sauce. This Brennan family-owned restaurant on the busy block of Canal Street is known for its upscale Creole bistro menu and ample sidewalk seating. The restaurant’s original white chocolate bread pudding is as unique as it is popular. The chunks of white chocolate are baked inside the bread, and the whole thing is covered with warm white chocolate ganache and shaved dark chocolate. You can take a stab at the recipe from the Palace Cafe: The Flavor of New Orleans Cookbook. Ralph Brennan’s Red Fish Grill has been around for more than 20 years, offering a child-friendly respite in the middle of the Bourbon Street chaos. It’s known for its seafood-heavy menu and good happy hour deals on the drinks and the oysters. The well-reviewed double chocolate bread pudding is made with dark and white chocolate ganache (sauce) and chocolate almond bark. It takes about 20 minutes to prepare but it’s worth the wait. You can also try making your own: The restaurant shares this recipe from Ralph Brennan’s cookbook. 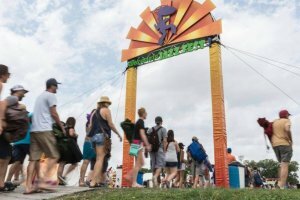 Can’t wait until you make it to New Orleans? Try this recipe at home.